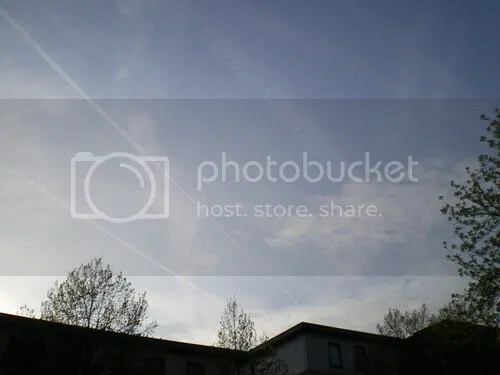 Earlier today I took several photos of chemtrails being formed over my home area in Nottingham. I was reading from my conspiracy-interested friends all day about how planes were back in the sky spraying chemtrails after a hiatus of some days (due to the volcanic ash cloud?). Upon going outside to get some fresh air I spotted plenty visible in the late afternoon light. I got my camera and went out to capture all the visible sights of them. It really is ridiculous that this has been going on for years and people think it’s just aeroplane contrails. I’ve uploaded them to Photobucket. Northwestward I think. Evidence of a whole series of trails going in a similar direction throughout the day - the more diffuse ones being earlier, the tight ones having only just happened. This entry was posted in chemtrails, conspiracy, evidence, local and tagged chemtrails, conspiracy, evidence, Nottingham, photos. Bookmark the permalink.